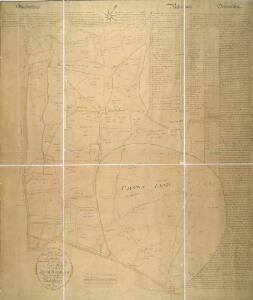 Description: This is Crace's own copy of an 18th-Century plan of the estates north of the New Road at Marylebone. The title and scale bar feature at bottom left, with compass at top centre, and descriptive notes at top left and down the right margin of the sheet. Outline colour marks the boundaries of estates and a single black line those of fields within the estate. The plan also reports the names of landlords and tenant occupiers, with key to the dimensions of each field and estate in a table above the plan.